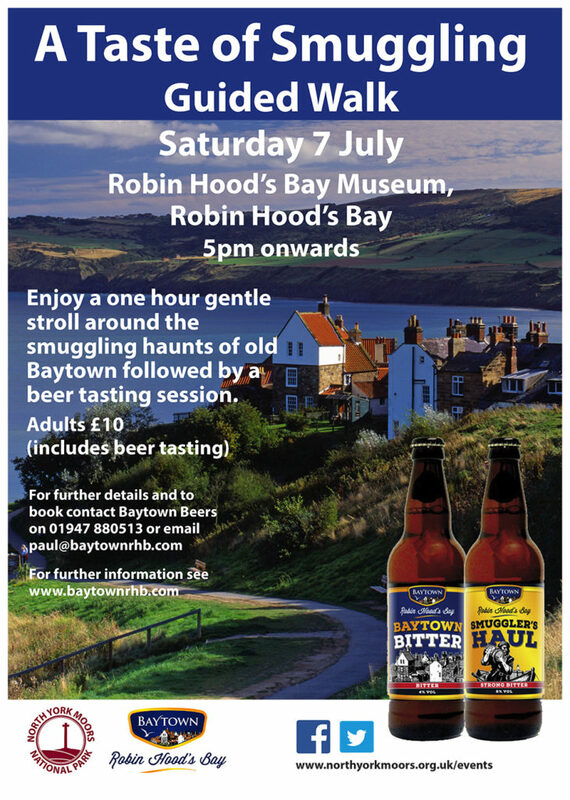 Discover the hidden smuggling secrets of Robin Hood’s Bay on Saturday 7 July at 5pm. In what will be this summer’s only Smuggler’s Walk, Paul Johnston of Baytown Beers will be leading ‘A Taste of Smuggling’ guided walk followed by a beer tasting. Places are limited and pre booking is essential at £10.00 through Baytown on 01947 880513. Paul has led this walk many times, including a sold out walk as part of the North York Moors National Park Walkfest. But with increasing time commitments the public walks have been limited this year. The walk will start outside Robin Hood’s Bay Museum on Fisherhead. The one hour gentle stroll around ‘old Baytown’ will highlight 18th century smuggling tales and reveal the hidden smuggling secrets of numerous village cottages. The tour will finish in the village with a beer tasting. The full range of Baytown’s smuggler’s beers will be available and Paul will outline the background to the beers and their history. Besides Baytown Bitter being on tap in the Victoria Hotel’s bar, Baytown’s bottled beers celebrate the village’s smuggling heritage. Baytown Bitter at 4% abv is named after the 18th century locals’ name for Robin Hoods Bay. Smuggler’s Haul is a 6% strong bitter with Squire’s Connivance a 5% Porter. Press Gang’s Arrival is a 4.2% pale ale, Revenue’s Revenge is a 4.2% premium lager and feminine wiles are celebrated with Petticoat’s Deceit a 4% premium cider. The walk and beer tasting can also be arranged privately, with Paul direct, for other times and dates. All places cost £10.00 and include walking tour and beer tasting. Tweets about "robin hood's bay"